"SA-8" redirects here. For the Apollo flight, see A-104 (SA-8). The 9K33 Osa (English: wasp; NATO reporting name SA-8 Gecko) is a highly mobile, low-altitude, short-range tactical surface-to-air missile system designed in the Soviet Union. Its export version name is Romb. The SA-8 was the first mobile air defense missile system incorporating its own engagement radars on a single vehicle. 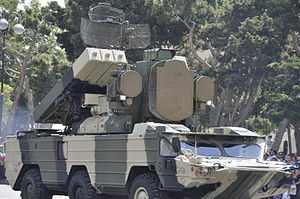 All versions of the 9K33 feature all-in-one 9A33 transporter erector launcher and radar (TELAR) vehicles which can detect, track and engage aircraft independently or with the aid of regimental surveillance radars. The six-wheeled transport vehicles BAZ-5937 are fully amphibious and air transportable. The road range is about 500 km. The 1S51M3-2 radar system on the SA-8 TELAR received the NATO codename Land Roll. It was derived from the naval `Pop Group' radar system but is smaller since it does not require the elaborate stabilisation system. An improved system designated the SA-8B `Gecko' Mod 1, was first seen in Germany in 1980. It had improvements added to the launcher configuration, carrying six missiles in ribbed containers. The system is reported to be of the frequency-agile monopulse type. It consists of an elliptical rotating surveillance antenna mounted on top of the array, operates in H band (6 to 8 GHz) and has a 30 km acquisition range against most targets. The large pulsed J band (14.5 GHz) engagement antenna is mounted below it in the centre of the array and has a maximum tracking range of about 20 km. Mounted on either side of the tracking radar antenna is a small J band parabolic dish antenna to track the missile. Below that is a small circular antenna which emits an I band uplink capture beam to gather the missile shortly after launch. The final antennas in the array are two small white rectangular ones, one on either side of the array mounted alongside the I band. These are used for command uplink to the missile. This twin antenna system permits the 'Land Roll' radar to control up to two missiles simultaneously against a single target. Furthermore, the two missiles can be guided on different frequencies to further complicate ECM. There is also a tubular device fitted to and above the tracking radar; this is a 9Sh33 electro-optical tracker. It can be used to track the target when the main tracking radar is jammed by ECM. A 9K33 battery comprises four 9A33B TELAR vehicles and two 9T217 transloader vehicles on BAZ-5939 chassis with reload missiles and a crane. A reload time of five minutes has been reported per TELAR. In addition to the TELARs, each regiment is also assigned a single radar collimation vehicle 9V914 (initially on the BAZ-5938 chassis but more often found on the ZiL-131 truck). This vehicle assists in the alignment of the TELAR's radar systems, ensuring accurate target tracking and engagement. SA-N-4 launcher covered by a circular plate on the Slava class cruiser Marshal Ustinov. 9K33 "Osa" (US DoD designation SA-8A "Gecko") began development in 1960 and was introduced in 1971–1972 with four exposed 9M33 missiles per TELAR 9A33B and a maximum range of 12 km (7.5 mi). 4K33 "OSA-M" (NATO reporting name SA-N-4 "Gecko") was introduced in 1972 and is the naval version of the system with two 9M33M missiles on a Zif-122 retractable rotating launcher and improved performance. It has been installed on Gepard class frigate, Kara class guided missile cruisers, Kiev class VTOL cruisers and also the Kirov, Slava and Krivak classes. 9K33M2 "Osa-AK" (US DoD designation SA-8B "Gecko Mod-0") with TELAR 9A33BM2 was introduced in 1975 with the new six-missile box launcher, each 9M33M2 missile being a sealed round. 9K33M3 "Osa-AKM" (US DoD designation SA-8B "Gecko Mod-1") with TELAR 9A33BM3 and missiles 9M33M3 was introduced in 1980 with the maximum range extended to 15 km (9.3 mi) and maximum altitude to 12 km (40,000 ft) as explained above. Most OSA-AKM systems also feature an IFF antenna. Saman and Saman-M (Russian Саман – adobe) is a development of the Osa\Osa-M system into target drones, used for testing and training with air defense systems, including SAMs. The 9K33M3 is also able to use the 9A33BM3 missiles which are wire-guided, presumably for use in an ECM-heavy environment where the radio command guidance may not operate properly. Engagement range for the early versions is approximately 2–9 km (1.3–5.6 miles) and engagement altitudes of between 50–5,000 m (164–16,400 ft). The 9M33M2 "Osa-A" missile extends the ranges out to 1,500–10,000m (1–6.2 miles) and engagement altitudes to 25–5,000 m (82–16,400 ft). The 9M33M3 missile greatly enhances the altitude engagement envelope to 10–12,000 m (33–42,500 ft), and as such are also able to fly further (about 15 km/9 miles) but the system is not able to engage targets at longer ranges, due to other factors such as the radar tracking of the missiles. The system is designed for use primarily against jet aircraft and helicopters in any kind of weather. The 9M33 missiles are 3.158 m (10.3 ft) long, weigh 126 kg (278 lb) and use command guidance. There is also a backup low-light optical tracking system for heavy ECM environments. The latest 9M33M3 missiles have an increased total weight of 170 kg (375 lb) in order to provide the extended range coverage and larger warhead. Propulsion is provided by a dual-thrust solid fuel rocket motor. Both versions feature a missile speed of around Mach 2.4 (peaking at around Mach 3) for a maximum target engagement speed of around Mach 1.4 for the original missile and Mach 1.6 for the M2\M3 missiles. The warhead for the initial and M2 versions weighs 19 kg (42 pounds), increased to 40 kg (88 lb) in the M3 version to improve performance against helicopters. All versions have impact and proximity fuzes. There have been unconfirmed reports of other possible versions of the missile with both infra-red and semi-active radar terminal homing seekers. Each TELAR is able to launch and guide two missiles against one target simultaneously. Kill probability is quoted as being 0.35–0.85 for the Osa and 0.55–0.85 for the Osa-AK and Osa-AKM (presumably depending upon target aspect, speed, maneuverability and radar cross section). Reaction time (from target detection to launch) is around 26 seconds. Time to prepare for engagements from being in transit is around 4 minutes and missile reloading takes around 5 minutes. Each battery of four TELARs is usually accompanied by two reload vehicles carrying 18 missiles in sets of three, with a crane mounted on the reload vehicles to assist in moving the missiles. When launched the booster motor burns for two seconds, this permits the radar to gather and control it at very short ranges (about 1.6 km). The sustainer motor has a 15-second burn, bringing the missile to a top speed of about Mach 2. Once launched the missile is command-guided for the whole flight, and the warhead is detonated by its proximity fuze or possible command. The warhead is said to have a lethal radius of 5 m at low altitude against a F-4 Phantom size target. 1S51M3 ("Land Roll") – C band target acquisition radar, H band conical scan target tracking radar and two J band pulse mode fire control radars (range 35 km/22 miles for acquisition, 30 km/19 miles for tracking and 25 km/16 miles for guidance). Mounted on the TELAR. P-40 ("Long Track") – E band early warning radar (also used by the SA-4 and SA-6, range 175 km/108 miles), mounted on a tracked vehicle (a modified AT-T). P-15 ("Flat Face A") or P-19 ("Flat Face B") or P-15M(2) ("Squat Eye") – 380 kW C band target acquisition radar (also used by the SA-3 and SA-6, range 250 km/155 miles), mounted on a ZiL-131 truck. PRV-9 or PRV-16 ("Thin Skin") – E band height finding radar (also used by the SA-4 and SA-6, range 240 km/148 miles), mounted on a KrAZ-255B truck. Produced by the USSR/Russia, there are many export customers for this system, including Cuba, Greece (from the former East Germany), Poland, Syria, Ecuador and Iraq. In late 1980s, Cuba deployed several SA-8 units in southern Angola which posed a significant threat to South African air superiority at shorter ranges. Iraq used Osa systems during the 1991 Gulf War. The South African 61 Mechanised Battalion Group captured an intact SA-8 anti-aircraft missile system on 3 October 1987 during the Battle of Cuito Cuanavale. This was the first time that such a system had ever fallen into the hands of non-Warsaw Pact forces, giving Western intelligence agencies an opportunity to examine an important Soviet-bloc weapon system. The system also saw use in the 2008 Russo-Georgian War by both the Georgian and Russian militaries. Libyan SA-8s were used, and some destroyed during the 2011 Libyan Civil War by NATO airstrikes. In order to prevent the threat to Azerbaijani aerial vehicles and suppress the enemy's activism, Azerbaijani Armed Forces have destroyed OSA surface-to-air missile system, a re-supply vehicle and personnel of the Armenian Armed Forces on May 15, 2017. During the Syrian civil war in December 2012, rebels fighting Bashar al-Assad's forces managed to capture at least one Osa system after a raid on an air defense base near Damascus. Later, on different occasions, videos showing rebels using the system appeared. On 31 July 2013, a video surfaced showing the successful missile launch for a rebel operated Osa system with a possible hit on a Syrian helicopter. On 16 January 2014, a video of the shooting down of a Syrian Mi-8 or Mi-17 helicopter was uploaded. The heavy damage on the plunging helicopter appeared to confirm the use of a bigger missile to hit the helicopter compared to the damage caused by MANPADS. Also, a video filming the TV screen inside the Osa vehicle matches another video taken outside. Another video surfaced on 18 January 2014, this time missing the intended target. On 15 October 2015, the Russian military reported that a 9K33 Osa system captured by rebel forces was destroyed in an airstrike by a Russian Su-34 bomber near Damascus. On 26 June 2016, Jaish al-Islam reported a new attempt to shoot down a helicopter and released a video of the event. The Ukrainian Joint Forces reported destruction of the Osa-AKM surface-to-air missile system of the Russian occupation forces along with Zhitel R-330Zh automatic jamming system in Donbass on 30 March 2019.
the 9F16M2 Ground Equipment Kit (GEK). The T38 "Stilet" is a further development of the Osa-1T. Main components are the TELAR T381 on MZKT-69222 chassis and the new missile T382. Maximum range of targets’ destruction 20 km, minimal RCS of targets detected 0.02 m². Osa-AKM-P1 "Żądło" (export name SA-8P Sting) is a Polish upgrade of the 9K33M2 "Osa-AK" and 9K33M3 "Osa-AKM". Probably 32 of the 64 systems purchased from the Soviet Union will be upgraded to keep them in service until 2017. An upgraded TELAR 9A33BM3-P1 was displayed at the MSPO 2004 exhibition in Kielce, Poland. The upgraded vehicle is fitted with a passive detection and identification system SIC 12/TA as well as the ISZ-01 IFF system. Romanian 9K33 Osa missile launch at Capu Midia firing range. Poland – 64. Probably 32 systems will be upgraded to Osa-AKM-P1 to keep them in service until 2017. Ukraine – 9K33M2 Osa-AK is in service. Czechoslovakia – One regiment which passed to the Czech Republic. Czech Republic – Phased out in 2006. East Germany – 41 Osa-AK. Partially sold to Greece after the German reunification. Iraq – 50 systems delivered from the Soviet Union between 1982–1985. [better source needed] As well as captured Kuwaiti units. Kuwait – Captured by the Iraqi forces in the Persian Gulf War. Soviet Union – Passed on to successor states. Wikimedia Commons has media related to 9K33 Osa. ^ "Прочие с долевым участием". www.kupol.ru. ^ Pike, John. "SA-8 GECKO / 9K33M3 Osa-AKM". www.globalsecurity.org. ^ "Designations of Soviet and Russian Military Aircraft and Missiles". Retrieved 14 November 2014. ^ "9K33M3 Osa-AKM". Retrieved 13 July 2008. .
^ Turton, A.R. 2010. Shaking Hands with Billy. Durban: Just Done Publications. ^ "Several Libyan arrmored vehicles and anti-aircraft systems destroy by the coalition forces". Retrieved 14 November 2014. ^ "U.S. aviators rescued; Gadhafi remains defiant". CNN. 24 August 2011. ^ "OSA missile system of Armenia was destroyed". Archived from the original on 26 April 2018. Retrieved 25 April 2018. ^ Oryx. "Oryx Blog". Retrieved 14 November 2014. ^ "ISIS retreating in Syria, missile system destroyed". Retrieved 15 October 2015. ^ "Conflict News on Twitter". ^ "Escalation in Donbas: One Ukrainian soldier killed, four wounded amid 19 enemy attacks in past day". Retrieved 31 March 2019. ^ "- -". Archived from the original on 26 September 2011. Retrieved 14 November 2014. ^ "933-1 SA-1 Short Range Air Defence System". Retrieved 14 November 2014. ^ "T38 STILET Short Range Air Defence System". Retrieved 14 November 2014. ^ a b "Defense & Security Intelligence & Analysis: IHS Jane's – IHS". Retrieved 14 November 2014. ^ "Советы по ремонту". Retrieved 14 November 2014. ^ "Defense & Security Intelligence & Analysis: IHS Jane's – IHS". Retrieved 14 November 2014. ^ "Âîîðóæåííûå ñèëû Àëæèðà". waronline.org. Archived from the original on 28 March 2014. ^ The Military Balance 2010. — P. 245. +The Military Balance 2012. — P. 317. ^ "Hezbollah has long-range surface-to-air missiles". Retrieved 5 September 2015. ^ "Старые комплексы ЗРК "Оса" все еще эффективны". Retrieved 14 November 2014. ^ ""Купол" защищает поле боя". Retrieved 14 November 2014. ^ Ignacio Fuente Cobo; Fernando M. Mariño Menéndez (2006). El conflicto del Sahara occidental (PDF) (in Spanish). Ministerio de Defensa de España & Universidad Carlos III de Madrid. p. 117. ISBN 978-84-9781-253-5. Fuente & Mariño. ^ "/ / : ?". 26 November 2012. Retrieved 14 November 2014. ^ "night-panther " Вооруженные силы Сирии". Retrieved 14 November 2014. ^ John Pike. "Turkmensitan Army Equipment". globalsecurity.org. This page was last edited on 13 April 2019, at 15:39 (UTC).